Junko Suzuki loves cats. For the past forty years, she's owned feline friends and collected cat memorabilia. She has so many cat-related items that she's actually turned her Tokyo house into a cat museum. There's even an entrance fee. Dubbed "Nyanyamoan" (にゃにゃもあん), the museum opened in 2012 and is located on the second floor of Suzuki's house. According to IT Media, she has over ten thousand cat goods. It took Suzuki two and a half years to organize and set up all her cat memorabilia, which she guides visitors through. Suzuki decided to create the museum because she thought it would be sad to just to pack away these faux cats she had acquired over the years. Creating a museum would be a good excuse to keep the items out. Cat goods she's collected over the years are stacked up on the walls, strung from the ceiling, and even coming out of the cabinets. 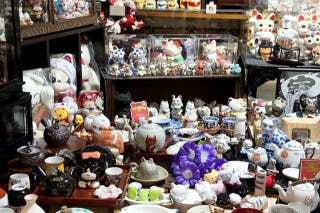 There are stuffed animals, posters, figures and other kitty knick-knacks. Speaking of kitty, there's lots of Hello Kitty. The bathroom is is also cat goods galore. Suzuki picked items that fit certain rooms. So, for example, in the bathroom, you'll find bath-related cat goods. In the house's Japanese room, there are Japanese-style cat items. Suzuki's cat museum is open from 11:30am to 5pm. Neko Keizai reports that the entrance fee for adults is 600 yen, while for elementary school students it's 300 yen. Those hoping to visit the museum need to call in advance to make an appointment.